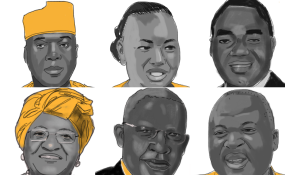 Nigerian Senate President Bukola Saraki, former Kenyan minister Sally Kosgei, Zambian opposition leader Hakainde Hichilema, Liberian President Ellen Johnson Sirleaf, Uganda's Foreign Affairs Minister Sam Kutesa and the brother of former Ghanaian president John Mahama, Ibrahim. Sally Kosgei was a member of the Kenya Parliament from 2008 to 2013 and minister of agriculture from 2010 until March 2013. Kosgei owned Zonrisa Ltd., a Mauritius company previously registered in the Isle of Man under the name Aisha Ltd. Zonrisa owned an apartment in central London near Harrods department store in 2001 which cost $1 million, according to emails sent to Appleby. Kosgei owned her offshore company in April 2001, when she began work as the cabinet secretary in the Office of the President. Kosgei’s ownership continued throughout her tenure as one of Kenya’s most powerful politicians. Documents sent to Appleby confirmed that Aisha Ltd. would use money from Kosgei’s company in Kenya, Zena Roses Ltd, to buy the London home. The 70 hectare Kenyan flower farm company exports roses to Europe. Kosgei told ICIJ that she bought the flat with personal funds before becoming the head of Kenya’s public service at a time when she expected to spend time in the United Kingdom due to her children’s studies. “There is no relation whatsoever” between the purchase and date of her work in the Office of the President, Kosgei said, and told ICIJ she acted on lawyer’s advice. She said it is not unlawful for Kenyans to buy property through offshore companies and that she had “satisfied all obligations (legal, professional and ethical) as a public official in Kenya” and declared everything that is and was required. There are legitimate uses for offshore companies and trusts. We do not intend to suggest or imply that any people, companies or other entities included in the ICIJ Offshore Leaks Database have broken the law or otherwise acted improperly. Many people and entities have the same or similar names. We suggest you confirm the identities of any individuals or entities located in the database based on addresses or other identifiable information. If you find an error in the database please get in touch with us. Copyright © 2017 International Consortium of Investigative Journalists. All rights reserved. Distributed by AllAfrica Global Media (allAfrica.com). To contact the copyright holder directly for corrections — or for permission to republish or make other authorized use of this material, click here.